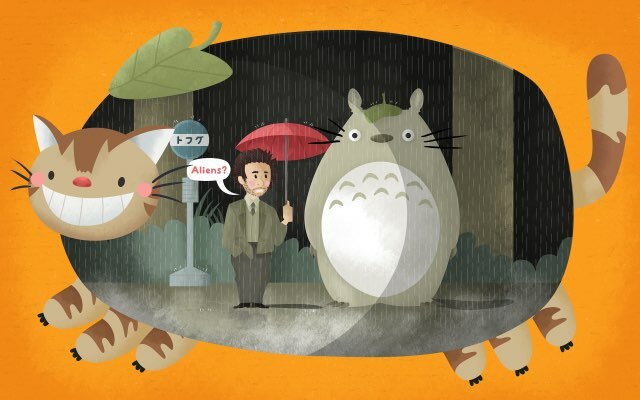 My Conspiracy Theory Nut Neighbor, Totoro Aliens? Who loves Studio Ghibli? 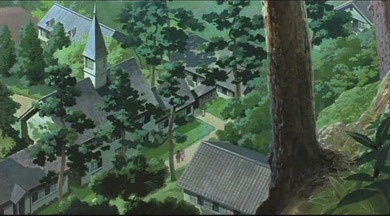 They're the studio that brought the world films like "Princess Mononoke," "My Neighbor Totoro," and "Spirited Away." I would guess that quite a few of you cried out "ME!" to your smartphones and computers in answer to this question. I would say the same thing too. I grew up watching Ghibli films. Characters like Totoro, the Little Dust Bunnies, and Kiki have always stuck with me, even to this day. The animation and musical scores are always beautiful, not to mention the stories themselves! 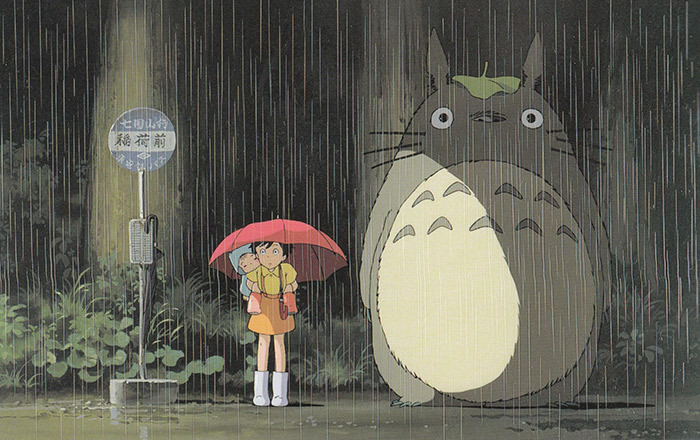 One of my favorite Ghibli films, 隣（となり）のトトロ (Tonari no Totoro / My Neighbor Totoro), has a deep and dark secret. Before we get into that, though, let's take a look at its fun, friendly plot! Many of you guys probably know of it already, but let me introduce it to you anyways. The story is about two young girls, Satsuki and her little sister, Mei. They move into a house in the countryside with their father to be closer to their mother, who is sick and hospitalized. Then, they discover magical creatures called Totoros inhabiting the nearby forest. They become friends with the Totoros and have magical adventures. Just to be sure, I'd like to explain that Totoro is not a Japanese traditional character but rather a creation of Hayao Miyazaki. They look like a mixture of several animals: fukuro 梟（ふくろ） (owls), neko 猫（ねこ） (cats), and tanuki 狸（たぬき） (raccoon dogs). They are so cute and one of my favorite characters in all Ghibli films. These cuddly creatures seem to be called many names varying from "a giant furry thing" to "a rabbit like spirit." One day, though, I found out that the name "Totoro" comes from when Mei mispronounces the word トロール (tororu), the Japanese word for "troll." It seems so clear watching the movie now, but as a kid I didn't realize this because the Totoro is so cute! Of course, I was shocked and thought, "TROLL???" My image for trolls wasn't cute at all. Instead, they were large, stupid, hairy, long-nosed, horned, and creepy bug-eyed creatures. 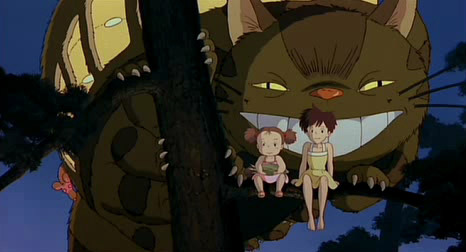 But, if Totoro is a troll, at least in the eyes of a child, what else could it be? Maybe the child didn't know better, so she called it a "troll" when it was something else. But what else? Some people out there think that the Totoros are shinigami 死神（しんがみ）, aka "Gods Of Death." 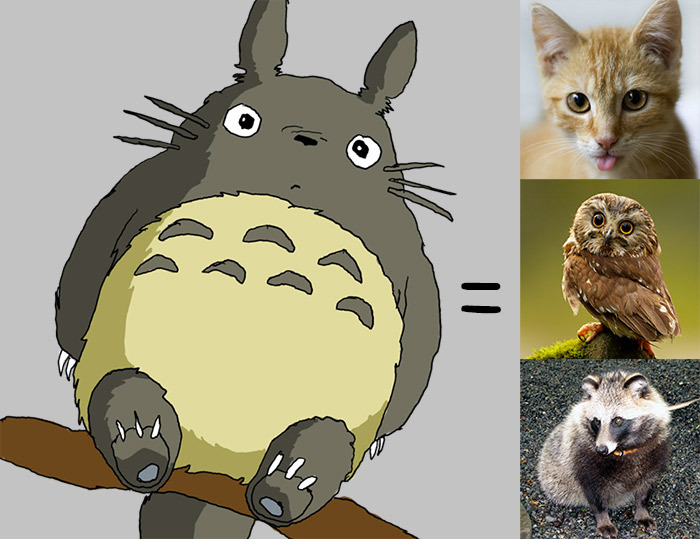 Considering how often Hayao Miyazaki puts hidden meanings into his Ghibli films, I think it is possible. If you keep reading, you'll see why other people think this, too. 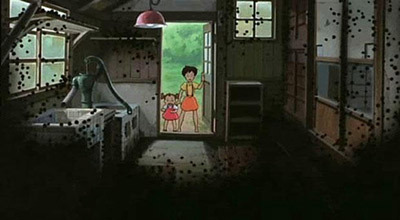 It has been said that My Neighbor Totoro is actually based on a famous murder case called "The Sayama Incident." 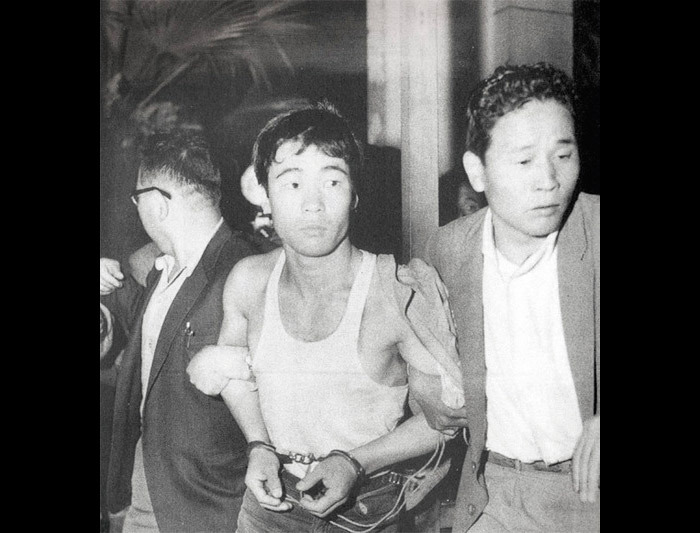 This case occurred on May 1, 1963 in Sayama City, Saitama Prefecture, Japan, when a man kidnapped, raped, and killed a 16-year-old high school girl. Although a suspect was arrested and imprisoned for 31 years, he claimed that he was arrested, wrongfully convicted, and the police failed to catch the real murderer when they had the chance. He also claimed official discrimination against Japan's burakumin 部落民（ぶらきみん） a social minority in Japanese society. He was paroled and released from prison in 1994, but he still remains guilty and continues to seek a fair trial for the chance to clear his name. The first clue for this conspiracy theory is that both of the sisters' names related to "May," the month that the Sayama incident occurred in. The older sister's name "Satsuki" means "May" in Japanese and the younger sister's name "Mei" is pronounced just like the English word "May." The hospital in the film, shichikoku byouin 七国病院（しちこく） had a real-life counterpart in Sayama, called the hachikoku byouin 八国病院（はちこくびょういん）. Only one number apart. Coincidence? Probably not. This hospital was supposedly located in the same place as portrayed movie. The girl who was killed in Sayama had an older sister who loved her little sister so much that she committed suicide after her death. It's said that the older sister was seeing big raccoon or cat-like ghosts before she killed herself, due to so much stress. The Totoros could have been inspired by this. It could be interpreted that Satsuki did the same in the film, though we'll talk about that in just a second. Early in the film the girls see these things, which apparently in Japanese folklore mean you're about to die. Not a good sign. They also appear later, when Satsuki tries to join her sister in death (whoops, spoilers, okeep reading). If you can see the Totoros (aka the God of Death), it means that you're either dead or almost dead. Kanta, the old lady's grandson couldn't see the Totoros even though he was a kid (supposedly kids can see the magic things, though in this case he couldn't). Yet, the two girls could see them. Remember when Mei goes missing and her slipper is found in the pond? Supposedly Mei actually drowned here. Ruh roh. Actually, though, the slipper is not hers (if you compare slipper pics). So, could this be a representation of something? Or, does it debunk all of these conspiracies? I'm sure you'll have an opinion on the matter. So, in this theory, Mei is dead. Satsuki goes to look for her, and opens death's door, going inside. She's so wrought with grief that she joins her sister in death, which emulates the girl's suicide in the Sayama Incident. Remember the susuwatari? They come back during this sequence. Death is not far away… she's running right into it! When she's crossed over to the other side, the Totoro then helps Satsuki to find her sister in dead-land, and then they later go visit their mother. Strangely, nobody notices they were there except for their mother, who is dying. "I felt Satsuki and Mei just laughed near the tree," the mother said. 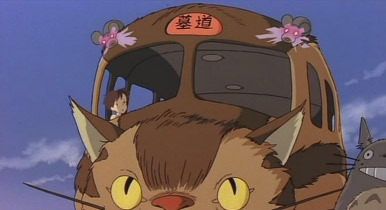 Some people think the Neko (Cat) Bus is a 1-way trip to heaven (or maybe hell). While I don't know about this, one of the stops on the Neko Bus is "grave road," so that sounds pretty must like dead people ride it to me. In the ending scene, Mei and Satsuki don't have shadows. Only dead people don't have shadows (for some unknown reason). There is a lot more of this, but this set of gifs summarizes most of the points. Gifs make everything more understandable, right? Prepare for your childhood to be torn straight from your hearts. This conspiracy theory has been around for a long time, actually. It got really heated on the internet, and then finally Ghibli had to make an official statement. In 2007, they did just that, denying that the urban legend was true. Still, when I was reading this everything made sense and it caused me to shudder and tremble when I thought about it. Who thought a children's movie could have such scary undertones! So, who's telling the truth? It seems like there's a lot here that makes sense. But, people will read into just about anything too much from time to time. Were you convinced either way? Or do you think it's just a silly story that someone made up. 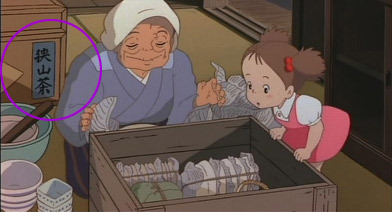 I think that Miyazaki likes to put hidden meanings in his films so… who knows.